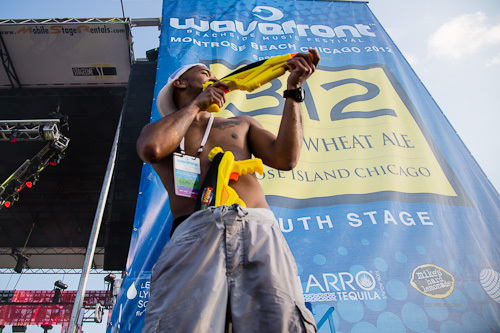 Wavefront Music Fest, Day One - No Drop, No Love? First year festivals are truly a force to be reckoned with. The festival producers are still feeling the crowd out. The attendees are still feeling the festival out. And no one has yet to determine the ideal means of enjoying the festival. The discovery of how to have the best possible experience is all in the hands of the inaugural crowd. 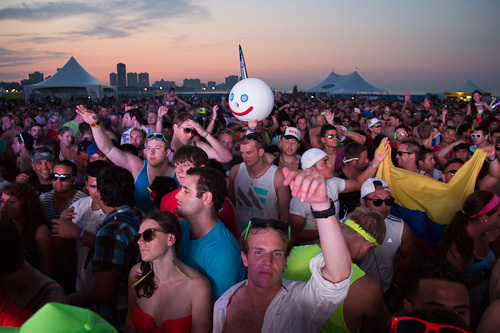 Wavefront Music Festival--day one, at least--was nothing short of an experience...a ridiculously fun one at that. Now, I don't believe the two should be compared but it's hard not to reference Wavefront without mentioning its fellow first-year Chicago dance festival Spring Awakening Music Festival which happened just two weeks ago. Let me repeat: this review is not a comparison of the two. I was thoroughly impressed by both and recognize their uniqueness from each other. However, just for the sake of context, if Spring Awakening was like an all-out-rager that college-bound kids throw the weekend their parents go out of town then Wavefront was the party the parents throw when their kids actually do move into the dorms. No, not old and boring. Professional, experienced, mellow, awesome. Just halfway through the weekend and it's this writer's humble opinion that this festival will go down as one of the best of the summer. As with any festival debut, there's bound to be some bumps along the way but most of the time those things are simply of of anyone's hand. In Wavefront's case, the folks behind it--the same folks behind veteran dance club Spybar--managed to keep the ratio of what rocked and what flopped on day one weighing heavily in the favor of rocking. The locale - ...was perfect. Montrose beach. 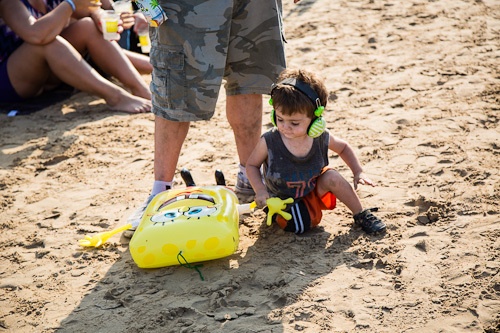 The actual, sand-covered beach was the home to the festival's two main stages with the two smaller stages and the vendor's row located in the shady grove just west of the shore. 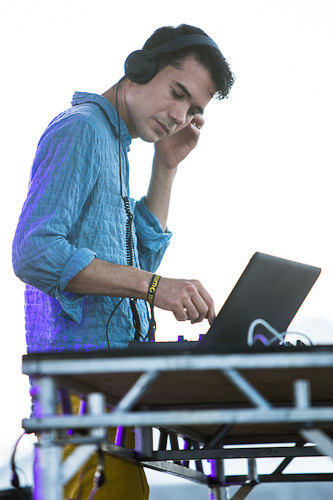 When performers like DJ/producer/techno pop wizard Matthew Dear started spinning jams that basically demanded dancing nothing felt better than kicking off your shoes and kicking up some sand. The experience - As I mentioned earlier it seems the goal of this dance music exclusive beach party was just for people to have a great time. Generous hour and a half sets for most of the artists gave you time to listen in on the tunes and wander the beach checking out the sites. The crowd deserves a pat on the back as well. Maybe it was the excessive amount of alcohol that was consumed (keep reading), maybe everyone was in some sort of heat-induced coma but it's been a while since I've been around such a mellow, friendly, good-time-having group of people at a festival. Minimal amounts of shoving, drunken debauchery and all around jerkery made for a day of smiles and new friends. 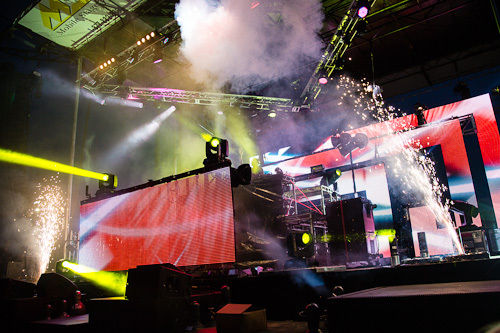 Target marketing - Rather than have fans schlepping back and forth across the beach in 90-degree heat, Wavefront successfully divvied up the artists to their respective sub-genre-inclusive stages. House and drum 'n bass beatmakers stuck to the North Stage. 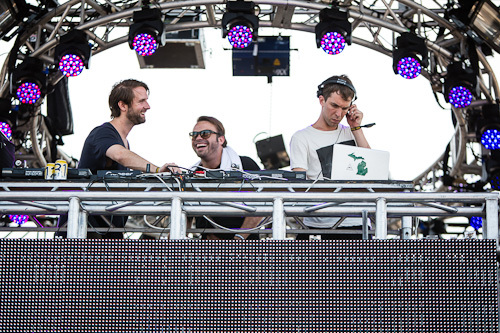 Heavier, more dubsteppier DJ's took to the South Stage. Local stars played the adequately named Local Stage and, well, the Solar Beatz Stage was a bit of a hodgepodge. But overall it was a very effective means of keeping the herding from one stage to the next at a minimum. Go-go dancers - Yesterday's appearance by MSTRKRFT was one of my most anticipated of the summer. My my, how they've only gotten better since I last saw them. It was awhile ago, I admit (Lollapalooza, '09) but my fondness for this Canadian duo has never waned. Scantily-clad, space-themed go-go dancers lining the stage and its center aisle; generous usage of the stage's CO2 canons; Jesse F. Keeler's 312-chugging, Parliament-smoking self; and a non-step mix of original melodic, bass-bumping beats along with perfectly beach-worthy sing-a-longs like Nero's "Crush On You" made me remember why. The light shows - If you're going to create a festival in which there's never more than one or two guys at a time standing behind a DJ booth, then why not cram the rest of the stage full of sweet lighting effects? Excellent call, Wavefront. 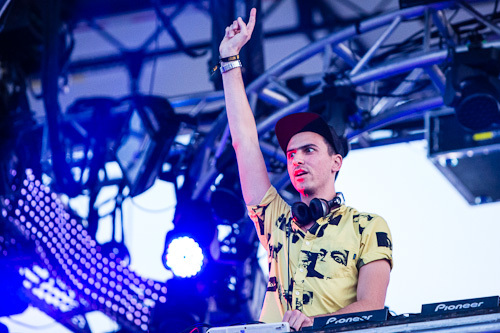 Nothing justified this decision more than Boys Noize's headlining set. Amidst a bombardment of strobes, lasers, sparks, flames, and a 360-degree LED halo that hung over the stage, the German techno house spinner looked like a god amongst visuals last night once the sun went down. Oh yeah, and did I mentioned they put on a freakin' fireworks show in the background? We're four days early and my Independence Day has already been made. The underestimation of Chicago livers - By 3pm the lines for drinks were 30 feet deep at some booths. By 5pm the VIP area bar was out of ice. And still, no one seemed too out of it. This is a good thing because nothing is more obnoxious than the combination of sun, sand and sweaty drunk dudes. However, it's also a good thing those set times were so long because one trip to the bar might have cost you an entire performance otherwise. Bless the folks working the festival yesterday, always with smiles on their faces. 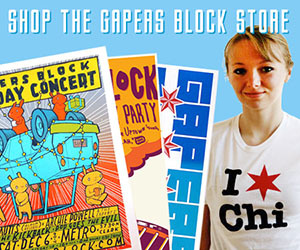 It was a non-stop barrage of thirsty Chicagoans. So much so that I doubt anyone could've kept up. The hydration situation - I'll pay for water at a festival. No problem. But, when it's 90-something-degrees, I need a lot of water. At four bucks a pop, a water bottle refill station could have alleviated the cost of keeping hydrated a bit. Dare I say, drum 'n bass - This is a problem that seems to be growing more and more prevalent in the dance music community. House music DJs missed the memo that you have to be performers now along with just being a DJ. Fans missed the memo that just because a DJ isn't jumping around and throwing neon-colored beach balls into the audience, doesn't mean they're not incredibly talented at their craft. 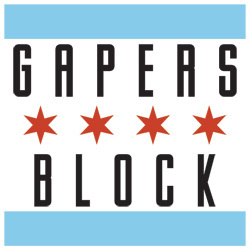 One of the reasons Wavefront garnered so much applause from Chicago music buffs is that it did seem dedicated to bring house music--which we all know was born right here in Chicago--back to the center stage. The festival producers did just that with the lineup they put together. But the energy at the North Stage, more heavily laden with house music performers, never seemed to match that of the younger, fresher, bass-dropping South Stage. Now that's not to say there wasn't a good turnout. There was never a time during which the festival's North Stage seemed barren. There was just less to look at. 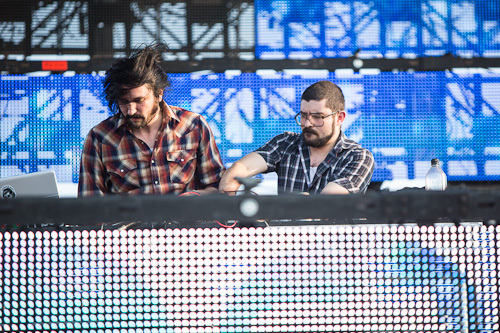 During acts like Visionquest and Art Department, some of my most anticipated sets of the fest, I found myself wandering south to check out the parties that duo Sultan & Ned Shepard and Chicago native Bad Boy Bill were throwing. 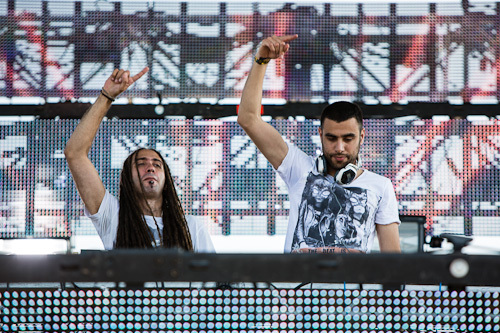 It wasn't until the night's headliner, the aforementioned headliner Alexander Ridha performing under his Boys Noize stage name, took to the North Stage that the energy really cranked up. Ridha's isn't the most traditional of house music. It's fused with techno for a faster, glitchier breed of sounds. But his sets are still very much house-induced. Without relying on any musical gimmicks, he managed to pull off a set that made both the drums and the bass his guests of honor. Day one was a go. Wavefront Music Festival is officially off to a great start. Day two should be just as fun, just as loud, just as hot. Let's do it. Learn something about music before writing about it, my ignorant friend. North stage was where it's at all day long! South stage was for newbies and people who don't understand what "mixing" is. I don't care if someone is fist pumping and head banging - they are NOT mixing! This festival attracted a lot of people who aren't used to festivals. That's ok, so long as they aren't rude. I must say though, that the people trying to cut in line for the bathrooms, the guy who pushed a girl friend of mine when she accidentally stepped on his hat he left on the sand, and the girls who yelled at the bartender for not accepting their cash when it was clearly a ticket bar, not a cash bar - these people need not come again. Overall, an awesome time though and can't wait for next year! "Generous hour and a half sets for most of the artists" - this isn't really "generous" for dj's as much as it is standard procedure, and you're wrong anyway because most of the artists (especially on sunday) had only hour-long sets. and it needs to mentioned that while the festival promo video showed people dancing in the lake, the water was completely inaccessible (and completely unable to be seen from inside the fest). same goes with water refill stations: this was mentioned on the festival's website but i never found them. $4 water (which was only available warm with a cup of ice later in the day) is poor form. 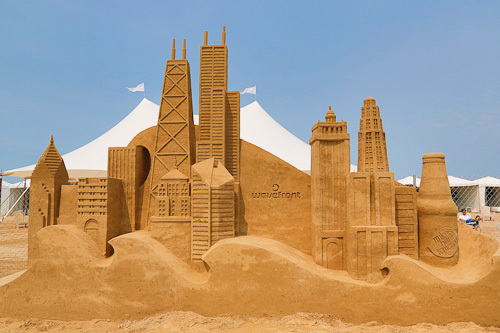 all that said, it was an interesting first-year experience, and indeed a bit surreal (and definitely exciting) to see this happen on the beach in chicago. and yes, i appreciated the generally laid-back crowd. and the sound was definitely solid. i'll hope next year (especially on that north stage) we'll see a few more riskier bookings (and a few less overall - let the artists have a bit more time to stretch out please! ), and we'll be able to go play in the lake. "the Swedish techno house spinner"??? I'm sorry but everyone knows that Alex Ridha is proud German.